The organisers of the Vuelta a España have announced the name of 22 teams that they say will dispute the 2010 edition of the race. These include wildcard selections for the Spanish Andalucia – Cajasur and Xacobeo Galicia teams, the American Garmin-Transitions squad, plus Cervelo TestTeam (Switzerland), Sky Professional Cycling Team (Great Britain) and Russia’s Team Katusha. Notable omissions include the RadioShack and BMC Racing Teams. Speculation suggested that the latter’s invitation might depend on world champion Cadel Evans wishing to take part, but the Australian has already ridden the Giro d’Italia and is set to ride the Tour de France. Three Grand Tours in one season is something that would be a tough undertaking, although some might have expected Evans to do a certain number of days in the race in order to prepare for his world championship title defence. Velonation has contacted the BMC Racing team to gauge a response, and has done likewise with Team Radioshack. General manager Johan Bruyneel confirmed in January that the team would seek to ride. “We don’t have a definite line-up for the team; as always, you have to wait for the Tour and see who finishes strong,” he said at the time. In recent days, a Twitter message by Criterium du Dauphiné winner Janez Brajkovic suggested that the Slovenian may have intended targeting the Spanish Tour if he didn’t ride the Tour de France. “Great job past week man,” he wrote to Tejay Van Garderen, who was third overall in the race. “Congrats. See u @vuelta?” The team today confirmed to Velonation that it had indeed wanted to participate, and said that an official reaction would be given later today. There is also no place for the Vacansoleil team, which has now been passed over for all three Grand Tours this season. Johnny Hoogerland finished twelfth overall for the team last year, while Boruz Bozic won a stage. The teams list also included sixteen squads which signed the agreement between the International Cycling Union and Unipublic on September 25th, 2008, thus giving them the right of participation. These are Ag2r La Mondiale (Fra), Astana (Kaz), Bbox Bouygues Telecom (Fra), Caisse D'Epargne (Spa), Cofidis, Le Credit En Ligne (Fra), Euskaltel – Euskadi (Spa), Footon-Servetto (Spa), Française Des Jeux (Fra), Lampre-Farnese Vini (Ita), Liquigas-Doimo (Ita), Omega Pharma-Lotto (Bel), Quick Step (Bel), Rabobank (Ned), Team HTC – Columbia (USA), Team Milram (Ger) and Team Saxo Bank (Den). Caisse d’Epargne and Euskaltel Euskadi had the first two riders overall last year, Alejandro Valverde and Samuel Sanchez. Valverde looks set to miss the race after being banned by the Court of Arbitration in Sport in relation to his part in Operación Puerto. The 65th Vuelta a España will begin in Seville on Saturday August 28th with a peculiar 16.5 kilometre nighttime team time trial. It will feature 40 classified climbs, including three ‘special category’ and ten first category, will have 46 kilometres of individual time trials and that 16.5 kilometres team test. 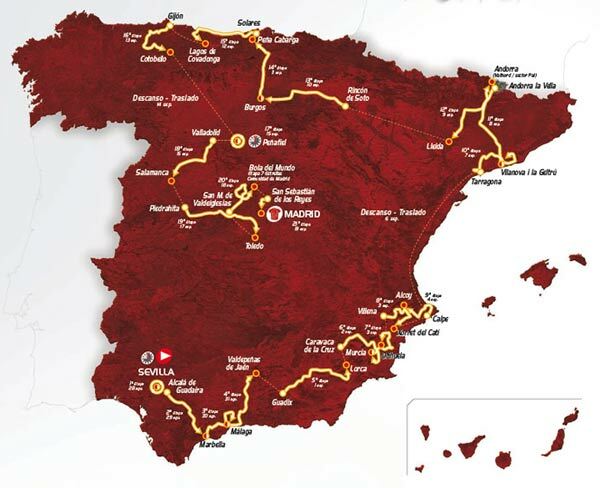 There will be first-time stage starts in Alcalá de Guadaíra, Caravaca de Cruz, Villena, Vilanova i la Geltrú, Rincón de Soto, Solares, Peñafiel and Piedrahita, and first-time finishes in Valdepeñas de Jaén, Orihuela, Vilanova i la Geltrú, Cotobello, Peñafiel and Bola del Mundo.